We are not accepting new orders at this time. Please check back later. The Lazer Swarm Command Center is a device that allows hosting Lazer Tag Team Ops (LTTO) games from a Windows computer. The Command Center connects to the computer over USB and uses six high powered IR emitters and two IR receivers. It is compatible with all five models of Lazer Tag Team Ops taggers (Deluxe, IRT-2X Drone, Tag Master Blaster, Phoenix LTX, and LTAR). The Command Center supports nearly all of the game modes supported by the taggers including the hidden modes of the Drone and Tag Master Blaster taggers. You can create and save lists of player names and assign them to taggers that have joined. You can create and save rule presets with your preferred game settings (game length, number of reloads, number of tags, etc). At the end of the game, a scoreboard is shown with the team ranks, player ranks and scores, and a grid of how many times each player tagged each other player. The scoreboard shows players names so it’s easy to see who tagged whom and how many times they tagged them. The scoreboard can be shown in a window or full screen on a second monitor. One year warranty and support provided. This product is built by hand in small batches. Assembly time and availability of parts may delay shipment by as long as a month. For an estimate of current lead time, please send us an e-mail. What’s the lead time right now for LazerSwarm? I should be able to ship up to three units in about a week. Ok. If I remember correctly, shipping to Singapore is USD$50? Shipping outside the US and Canada is $47.60. I am very interested in 2 units, I Live in the Netherlands and have LTTo, LTX Phoenix (Nerf and Tiger), a few IRT and some master blasters. Are they all compatible together? Because this will increase the value of your system. Do you have some snapshots of the software?? Yes, they are all compatible with each other. Do you still sell these? Your sales email isn’t valid anymore, could you please contact me via email for more communication. Maybe I can help with a translation into Dutch. Also I like to know the estimated delivery at the moment. Yes, they are still for sale. I’ll check my sales email address and see why it isn’t working. Did you get a bounce message? I haven’t added the ability for the software to be translated yet but I am considering it. Currently, I can ship up to three units in about a week. Shipping time to Netherlands will probably be another 1-3 weeks, but I don’t know for sure. I’m ready to buy today, do you have any available to ship soon? I can place the order once you give me the go. I started building three units today. Two are already spoken for but the third is up for grabs. I should be able to get them shipped out this week. Copy I just placed the order, shipping to Louisiana. Thanks! Do you have anymore for sale? I have parts on order but it will take about 2-3 weeks for all of them to arrive. Ok. So the soonest that you will be able to ship them out will be in about a month? Yes, I should have units ready to ship in around 3-4 weeks. Received my Lazer Swarm. Bought my first PC in a decade just to run it. I am in love! Thanks. Glad you like it. Have fun! I order one of these units on Oct 6th when should I expect to receive it? It’s looking like around 3 weeks. Sorry for the delay. Bought one of these last year and REALLY liking it. Just one little idea. When we play, we use the same teams over and over again. It is really slow to drag the names onto the players after the guns have joined. Would it be possible to have an option to re-use the same player assignments from the last game? That way we can join the guns in a known order to match player names listed – which we have to do as we are using LTAR and LTX units. I’m glad you like your Command Center. Thanks for the feedback. I’ve been thinking about how to improve the player joining process and I’ll keep your idea in mind as I come up with a plan. I can ship you a unit in about a week. I just wanted to leave some feedback and describe our experience. I now own two of these systems and 48 LTAR Lazer Tag Guns. We use them with our youth to host laser tag nights. Last year, I ran the event with 1 system and 24 guns. We had a lot of fun but the major complaint was how long it took to download the data and reconnect the guns. Because each gun operates independently from the system and stores it’s own data and then has to download it to the command centre, it adds a few minutes once you get up to a fair number of guns. That’s why I purchased another one. Rather than let it be a hinderance, I recognize this is a really unique product. As far as I’ve been able to research no one on the market has a similar product. I bought another 24 guns and another command centre and now while one group is running a game, we start setting up the second. The biggest delay is still the download time, but it’s a lot more manageable when you have another game about to start running. As soon as game one starts, 24 more players get set up for game two in an adjacent room with our second set of equipment. It takes about 7 minutes to connect 24 guns. We don’t let players have their own specific name – with 90+ it’s too much to sift through, so we drag a call sign from a pre-created list and tell them their name for that game. For every game after the first two, when players come back, they drop off their gun and immediately head to our main youth area. We download the data, get the score sheet and save it to a USB drive. We pop it in the computer in the main youth area and toss it up on our projector. The download takes about 3 minutes or so, so between the download and reconnect it takes about 10 minutes which just leaves 2-3 minutes to recap the rules for that game and get them out again. Very little downtime. The ability to use the command centre as a respawn point, ammo refill etc. The ability to restart a game with the same players without having to reconnect everything. Until then, I’m still very satisfied with my purchases. Thanks for your review. I’m glad you like your Command Centers. Sounds like the kids are having a lot of fun. As for the features you requested, the Command Center will already act as a respawn point in respawn game types. As for refilling ammo, that’s not possible with the LTTO protocol. There is an LTAR-only protocol that supports it but the only people who know its details are under non-disclosure agreements and can’t tell me about it. Unfortunately, the protocol also doesn’t support restarting a game without all of the taggers going through the joining process again. If I made a payment tonight, when could i expect one unit? I should have one ready to ship early next week. I’d really like to but then everyone would want one for $50. Here’s my suggestion: use your $50 to buy some Deluxe taggers on eBay. I think you’ll have a lot more fun being able to play with more people. The Deluxe can also host games like the Command Center just with more limited ability to see scores. Then save up for a Command Center or ask for one for your birthday or something. Thank you very much! I am saving up for one. I should be able to have one ready to ship to you by the middle of next week. Yes, you will receive a tracking number. Great. Can I get a total from you? When I click on ‘buy now’ it doesn’t include the shipping cost to Singapore. Oh wait. I got it. Didn’t see the ship to other countries option. Just placed my order. Can you confirm that you’ve received it please? I have received your order. Thank you! Great! Btw, what’s new in the 2.0 beta? I’ve receive the command centre!! Really cool stuff!! Thanks so far for inventing it! I have a question though: Is the red light supposed to remain lit as when the taggers are being detected? The green beam is lit and flashing and the buzzer is …er…buzzing. The taggers are being detected and work perfectly well with the command centre. However, the red light is still slightly visible amid the green. Is this normal? Thanks again for giving lazertag the means to be played the way it should be played!!! I’ve received the command centre!! Really cool stuff!! Thanks so far for inventing it! I have a question though: Is there a reason for the red light to remain lit as the taggers are being detected? The taggers are detected and work perfectly well with the command centre. However, the red light is still slightly visible amid the green. Is this normal? The bright green light is the main status light. 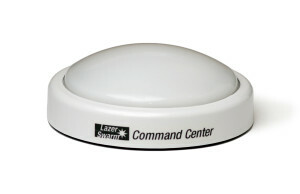 It flashes when the Command Center sends or receives data from the taggers. There are three other small lights. Their colors might be different on different units. One shows that the Command Center is receiving power from the USB. This is probably the red light on your unit. The other two flash when the Command Center sends or receives data over the USB. Rev D units will no longer have these three lights. I would like one. Home much is shipping and tax to Texas 77494? It will be $149.99 to Texas. Tax is only for Minnesota and shipping is free within the US. I need to order some parts so it may be 2-3 weeks before I can get yours shipped. Can you make a replacement to the master blaster missle? Sorry, I don’t have any plans for anything like that. The electronics probably wouldn’t be all that hard but I have no idea how I’d make the missile itself. I can handle the missile as nerf missiles are suppose to fit and work. If you would be interested in making the electronics or even making me a parts list and diagram I would be interested. I need to keep my focus on other things right now. You might try in the Laser Tag Modders Facebook group. Maybe someone there would be interested in collaborating. I am definitely interested in purchasing atleast one of these very soon and, judging by the comments, a lot of other people recently are as well. Congratulations on a successful product! I didn’t see on the forum or elsewhere if you had made the units available for more than 16 players (besides the “hack” referred to on the forum). Do you have plans of expanding the amount of players the system is able to host? Thank you for your time! Ahh I just saw the older comments asking more or less the same thing I just asked about…any recent success in getting around the 8 player per team limit? You can have up to 24 players per game which is a hard limit of the protocol. In team games, there is also a limit of 8 per team. There are ways around that and the work I’m doing on the beta will help make features like that easier for me to add. I’m really interested in buying your product for our Club. – What is the current waiting time ? – Is it possible to customise the logo above the scores (would love to put our logo tere) ? Lead time is currently about 2-3 weeks. Yes, it will run on a tablet with Windows 10. Yes, the scoreboard can be customized (it uses an HTML template). What’s the difference between rev c and rev d? There’s no functional difference, they all work the same. Rev D just makes it easier for me to build. Rev A-C used an Arduino Pro Micro connected to a custom through-hole PCB. Rev D combines the two boards into one custom surface mount PCB. The three small lights I mentioned in the other comment are on the Arduino board. They aren’t useful for the Command Center so I didn’t include them on the Rev D board. Help! I can’t figure out how to play the team games. When I start hosting a 2 or 3 team game, the command centre starts beeping and the lights start flashing. But my screen states that all the teams and player boxes are ‘open’. I can’t seem to assign names to the boxes neither. When I switch my LTXs on, they don’t register with the command centre and just announce ‘team 1’ or ‘team 2’ or ‘solo’ and plays ‘on its own’. What am I missing here? Thanks in advance. Correction to the earlier post: When I switch to ‘solo’, the tagger responds with ‘any team’. What do I do next? Cool! Works great! Thanks Riley. Hi, I just found your site. This is cool. I am in the process of buying 4-Nerf Lazer Tag Phoenix LTX Tagger 2-Pack. So this works for multiple guns then? what is the best gun to use for game-play? I would suspect some are better than others? Is it better to use all the same guns? How soon could I get one if I ordered now? I am in Canada S4L5B1. Up to 24 taggers can join a hosted game. Each of the tagger models has its own pros and cons. You can mix and match different tagger models in a game, everyone doesn’t need to have the same model. I can have a unit ready to ship to you by early next week. Hi, ok, I downloaded the app, now I have a few questions. Sorry, it has been years since I played. I think I know most of these answers but I want to be ready for summer. shields, there are unlimited shields? I can just adjust the length of time? What is mega? (that is the 3 hit shot?) only some guns looked to have this, is that correct? hide and seek? is this solo? one on one? is this 2 players? You can adjust how many total seconds players can use shields in the game from 0-99 seconds. It can’t be unlimited. Players can use shields for up to ten seconds at a time with a two second cool down between uses. Mega tags can add up to three additional tags to a shot for a total of four. Mega tags are only supported by the Deluxe and LTAR taggers. Team tags is another name for friendly fire. If it’s enabled, players can tag other players on their own team. Medic mode is complicated. It is only supported by Deluxe taggers and allows players to donate their tags (health) to other players. Slow tags limits the frequency at which players can be tagged to around one tag every other second. The protocol only supports up to 24 taggers. There are ways around it but the Command Center software doesn’t support that yet.